Bring important tasks to your attention via email, mobile push notification, web-app notification, or browser alerts when start and due dates are near! Due Date before overdue reminder: Be reminded before your task is due! You can choose to be reminded from 5 minutes up to 3 days before your task is due! Due Date after overdue reminder: Your safety net! 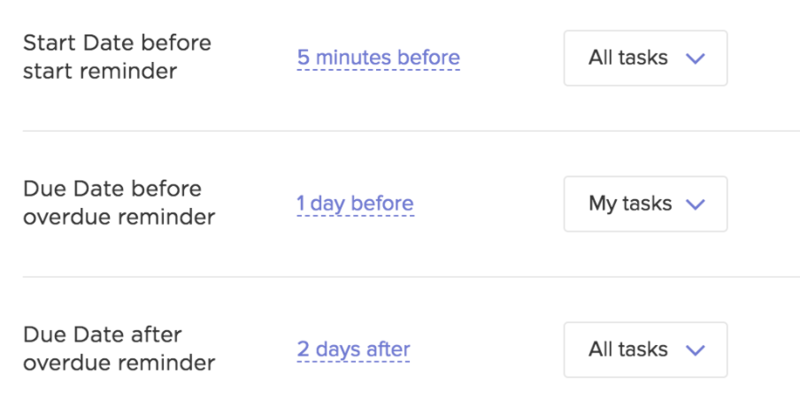 You can be notified up from 5 minutes up to 3 days after your unfinished task goes overdue. Start Date before start reminder: Be reminded before your task is scheduled to start! You can choose to be reminded from 5 minutes up to 3 days before your task starts! You may also select whether to receive the following notifications for all tasks you're watching or just the one's you're assigned to. To learn more about managing reminders in the app, view this article.